(a) Disconnect the connector from the skid control sensor. (a) Mount the hub & bearing assy on a soft jaw vise. NOTICE: Replace the hub & bearing assy if it is dropped or receives a strong shock. (b) Using a pin punch and hammer, drive out the 2 pins and remove the 2 attachments from SST. 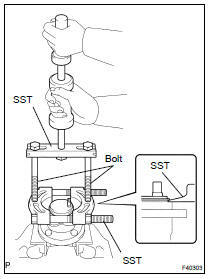 (c) Using SST and 2 bolts (Diameter: 12 mm, pitch: 1.5 mm), remove the skid control sensor from the hub & bearing assy. If damage is inflicted to the sensor rotor, replace the hub & bearing assy. Do not scratch the contacting surface of the hub & bearing assy and the skid control sensor. (a) Clean the contacting surface of the rear axle hub and a assy and a new skid control sensor. NOTICE: Prevent foreign matter from attaching to the sensor rotor. (b) Place the skid control sensor on the rear axle hub so that the connector makes the lowest position under the onvehicle condition. (c) Using SST and a press, install the skid control sensor onto the hub & bearing assy. Do not tap the skid control sensor with a hammer directly. Check that there is no foreign matter on the skid control sensor detection portion. Press in the skid control sensor straight and slowly. (a) Connect the connector to the skid control sensor.